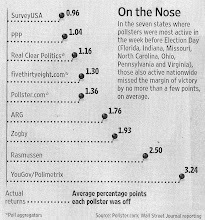 Public Policy Polling: A primary challenger to Obama? If there's any state where you could imagine there being a serious desire among Democratic voters to replace Barack Obama with someone further to the left next year it would probably be Vermont. Not only is it one of the most liberal states in the country it's also the home of 2 liberal icons, Bernie Sanders and Howard Dean, who if there was going to be a viable primary challenger seem like plausible candidates. But our polling there finds neither of them would come all that close to Obama, an indicator that the likelihood of Obama facing any serious contest next year is pretty minuscule. Sanders would pose the more serious challenge to Obama but still trails 52-33. He actually would edge the President 50-38 with voters describing themselves as 'very liberal' but would face a 39 point disadvantage with 'somewhat liberal' voters at 62-23 and a 32 point deficit with moderates at 57-25. That the margin between Obama and Sanders is as close as it is probably has more to do with Sanders' popularity than unhappiness with the President. Obama's approval rating with Democratic primary voters in the state is 81/11 and his numbers with the far left are even better than that at 86/6. Sanders is even more popular than that though, boasting a 90/7 overall approval rating, including 97/3 with 'very liberal' voters. Even with Sanders' higher approval though most voters who have a favorable view of both him and Obama would still prefer Obama for renomination. Obama would lead Dean 61-24. He does 45 points better against Dean than Sanders with 'very liberal' voters, leading 61-28 while holding similar leads with moderate and somewhat liberal voters. Dean has comparable favorability numbers to Obama- they break down favorably 77/12- but again it's a case where voters like both Obama and Dean but want Obama to be the Democratic Presidential candidate. We'll probably keep hearing about the prospect of a liberal primary challenger to Obama until he accepts the nomination in Charlotte next year but there doesn't appear to be much of an appetite for it from voters at this point. Mitt Romney has a solid lead in Vermont, as we've found for him in every New England state except Maine. 26% say he's their top choice to 16% for Michele Bachmann and Sarah Palin, 10% for Rick Perry, 9% for Herman Cain, 7% for Ron Paul, 6% for Newt Gingrich, 3% for Jon Huntsman, and 1% for Tim Pawlenty. If you take Palin out of the picture Bachmann picks up a large chunk of her support and narrows Romney's lead to 8 points. He gets 29% to 21% for Bachmann, 11% for Perry, 10% for Cain, 9% for Gingrich, 8% for Paul, 2% for Perry, and 1% for Huntsman. Bachmann narrowly edges Romney with far right voters, 30-28. But he makes up for that with solid leads among moderates (31-18) and 'somewhat conservative' voters (32-19). Pawlenty at 1% is just hilarious. Huntsman just rolled out of bed and he's tripling T-Paw. Numbers glitch? Huntsman gets 3% with Palin in the field but drops to 1% after redistributing her vote to others? Also surprising that the second biggest recipient of Palin's 2nd choice votes is Newt. You said Perry gets 11 and 2 when Palin is not included. I assume you meant Pawlenty gets 2. Also is there any explanation why Huntsman loses support when Palin is not included? I saw this the other day in Virginia when Perry lost 2% when Palin wasn't included too. Why does this happen? It makes no sense. This talk of a primary challenge of Obama from the left is stupid. Really really stupid.